If you haven’t noticed by now, Lamb is my favorite protein of all time. I absolutely love the flavor of the meat and I crave it weekly. It also has great health benefits like the fact it is an excellent source of Iron and it is a rich source of healthy fats like Omega-3 fatty acids and CLA, to name a few. Lamb wasn’t a source of protein that I was ever introduced to growing up, my parent’s really kept it down the straight and narrow with beef, chicken and the occasional fish… but for me, it’s something I incorporate in my diet regularly now. If you haven’t ever tried Lamb, I can’t encourage you enough to branch out and give it a try. It’s sooo good. A great way to introduce lamb into your diet that is simple and delicious is by using ground lamb like I did here. 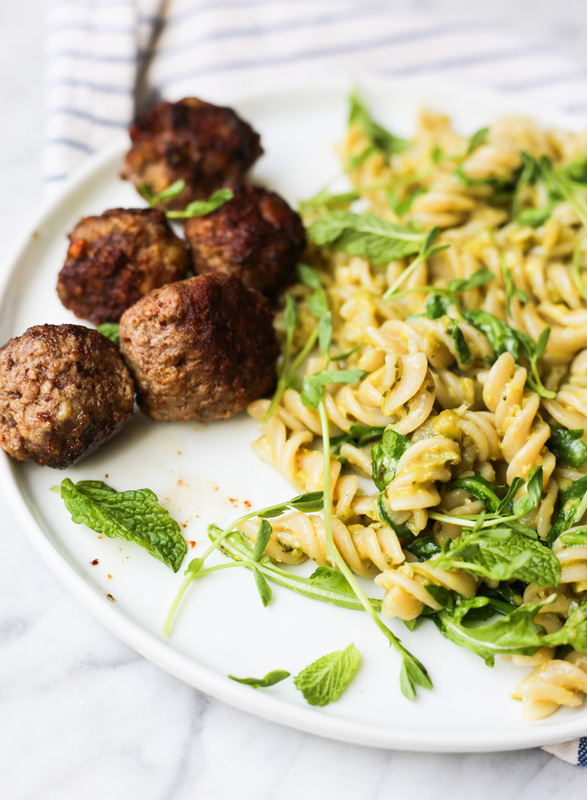 I love whipping up lamb burgers and lamb meatballs and today, I am sharing a fun, spring pasta dish alongside my easy lamb meatballs. 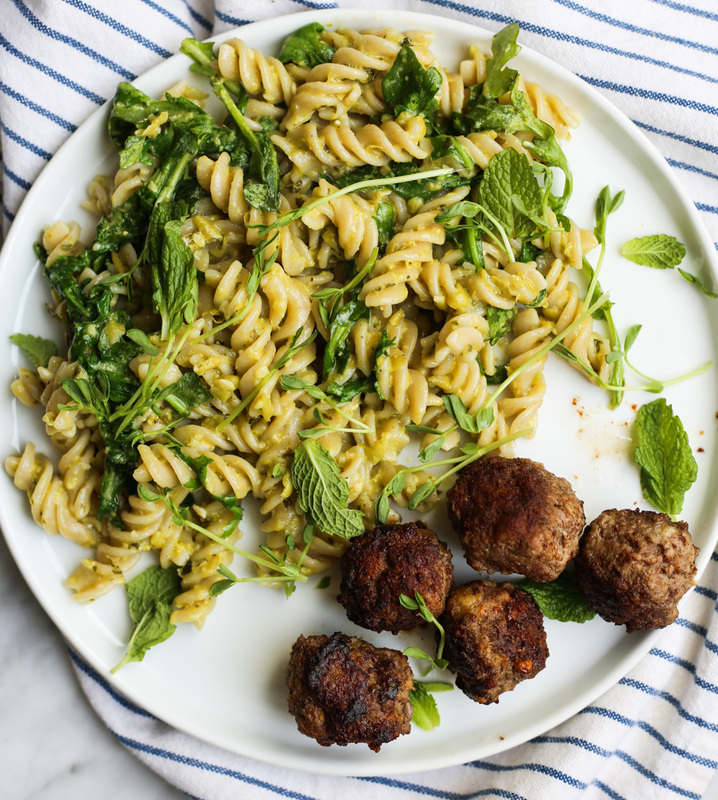 The pasta is tossed with a fabulous pea and mint pesto, which compliment the flavor of the lamb perfectly! 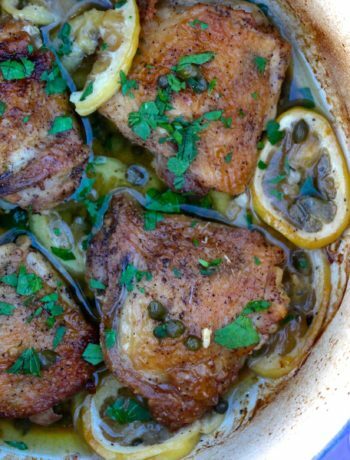 Today, I’ve happily partnered with Moink Box to bring you this delicious spring dish. 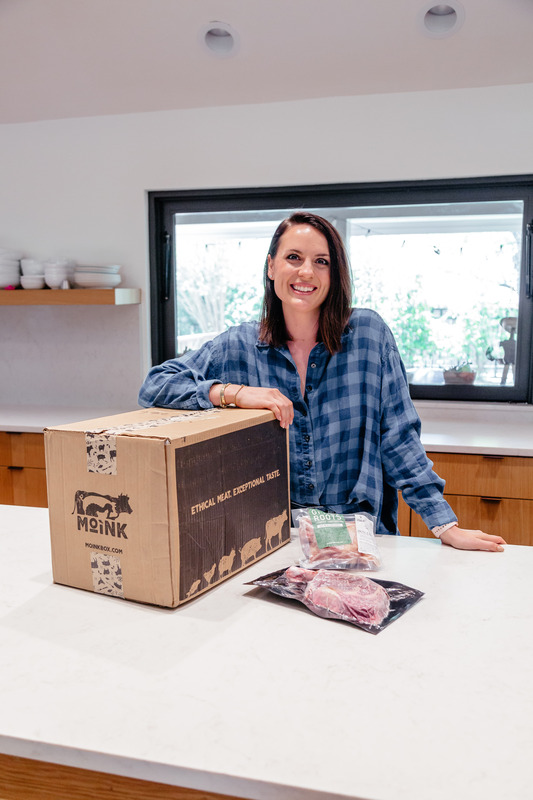 Moink is a farmer owned and operated community that ships humanely-raised, ethically-sourced meat directly to your door, perfect for busy, health-minded families who want quality, ethically-sourced meat for a reasonable price straight to their door step. I love that the boxes are fully customizable, you start off by selecting one of the four box types and tailor from there. I opted for the Beef, Lamb, and Chicken selection and kept it just as it was. I am very pleased with the meat quality plus, Moink beef and lamb is grass-fed. The chicken, beef, lamb and pork are pasture-raised AND the fish is sustainably wild-caught in Alaska. The majority of Moink animals are “farrow to finish,” meaning they spend their entire lives on the same farm with the same care takers and they put great care into making sure animals are humanely harvested, preferably on a farm or with artisan processors. Moink meats do NOT contain: antibiotics, growth hormones, genetically modified grains, artificial colors or solutions, sugar, nitrites– making all of their meat Whole30 compliant! 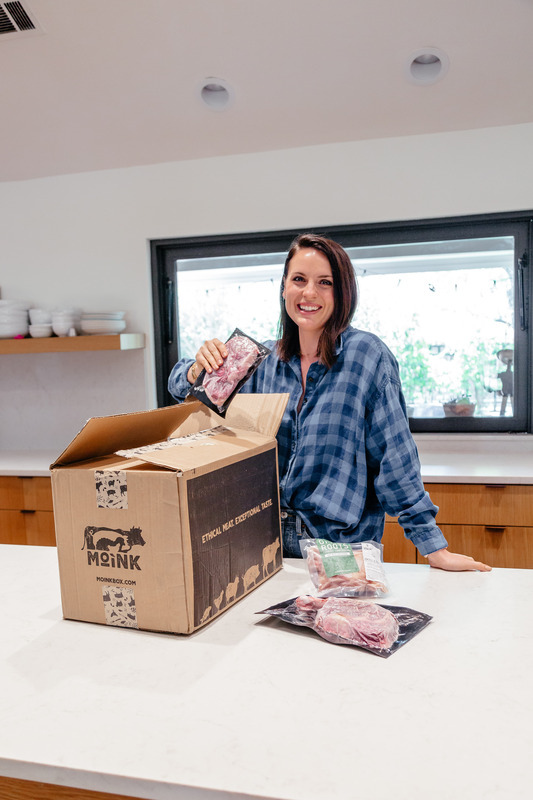 Each Moink box contains 13-16 pounds of meat, working out to be less than $4.50 per serving! So, what came in my Beef, Lamb, and Chicken Box? latest news and an inside-look at their farms. Bring a small saucepan of water to a boil. Add the peas and boil for about 3-5 minutes, or until peas are thawed and softened. 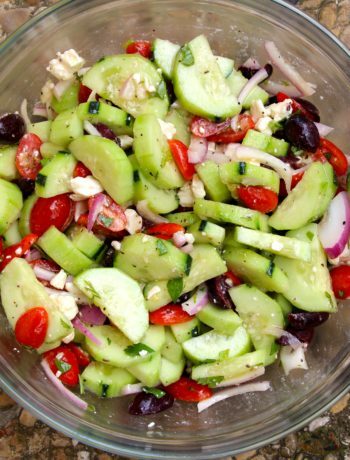 Drain off water and add to a food processor or blender with the mint, pinenuts, extra virgin olive oil, lemon juice, garlic, salt and pepper. Blend until smooth. Set aside. Bring a large saucepan of water to boil. 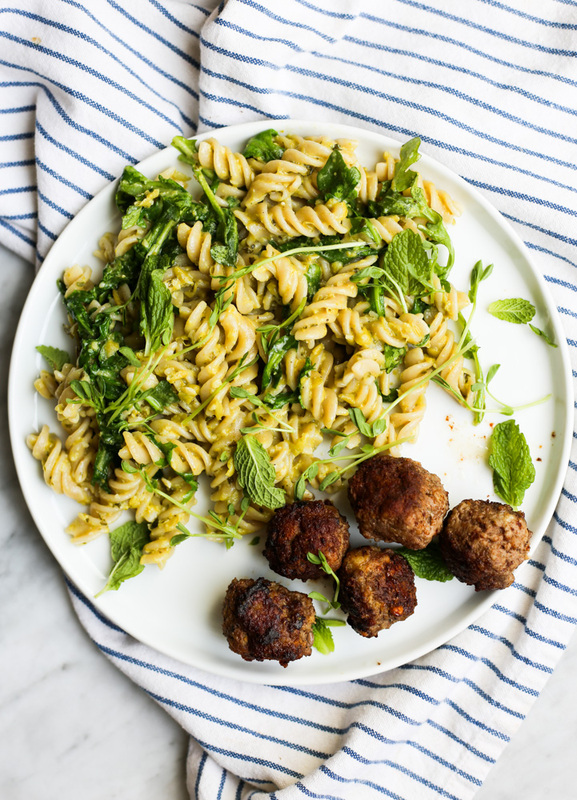 While you wait, prepare your meatballs. In a bowl, combine lamb, garlic, oregano, egg yolk, almond flour, salt and pepper. Using your hands, mix until well combined. Now, using a melon baller or a tablespoon, form evenly shaped meatballs and roll with your hands into balls. Continue until all of the meat is rolled. Heat a large skillet over medium-high heat. Add olive oil and when hot reduce the heat to medium, drop meatballs into the oil and fry on all sides until browned and just cooked through, or no longer pink in the center-- about 7-10 minutes. Meanwhile, add the box of pasta to the boiling water and cook according to package instructions. 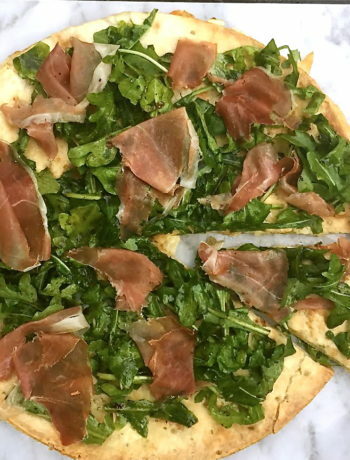 Drain when cooked through and toss with the mint pesto and arugula. 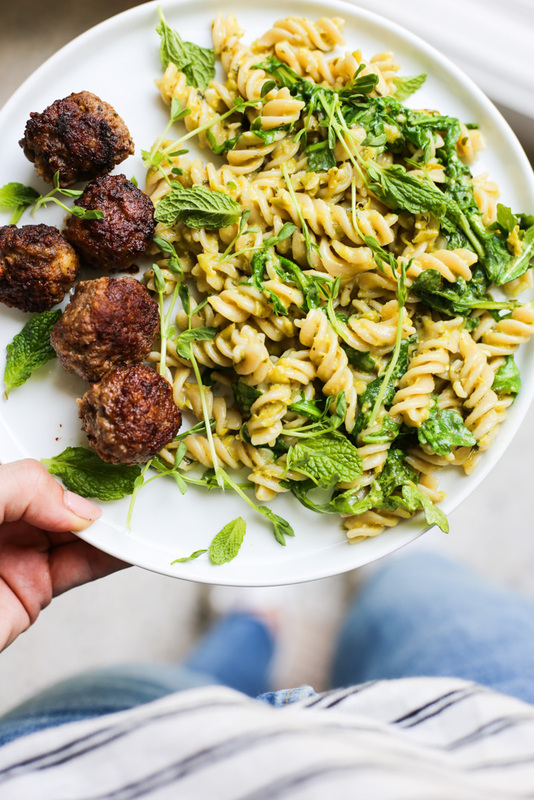 Serve pasta with the lamb meatballs and garnish with extra mint and crushed red pepper flakes, if desired.